MY WATCH COLLECTION (COACH, GUESS, MICHAEL KORS, FOSSIL). Watches are a great accessory and I highly recommend wearing a pretty one! I love watches and I love to pair them also with a bracelet. A watch can transform a simple outfit into a stunning outfit! You can wear just jeans and a T-shirt but with a nice big watch it will look right away stylish! 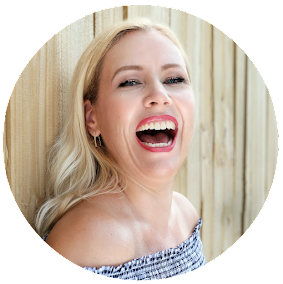 I am sharing today some of my favorite watches with you (some of you have seen these already on my Instagram). 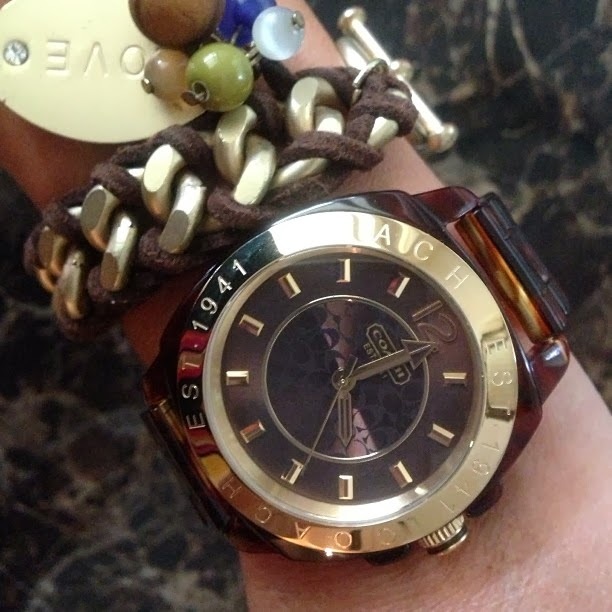 This is my coach watch which fits perfecty to my bracelet I got from Kohl´s. I am since a couple years in my gold phase but I made a little excuse for this beautiful Michael Kors watch which is silver with a grey leather band. The good thing is that today you can even mix gold and silver- there are no strict rules anymore- anything goes! 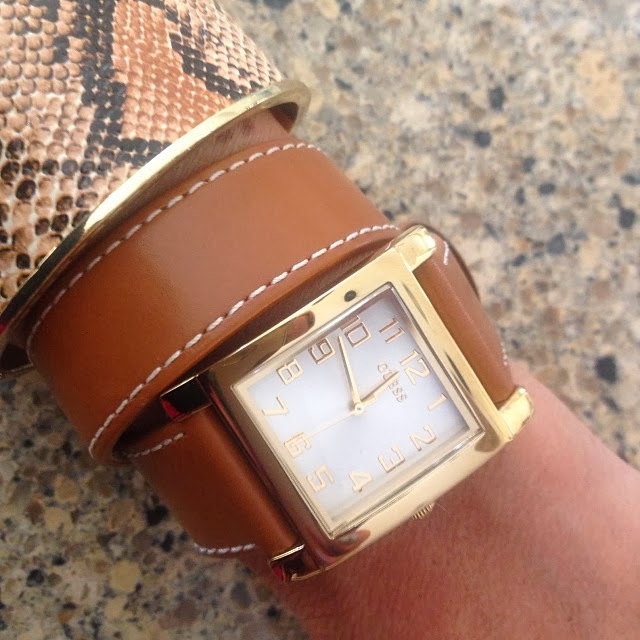 Another great idea is to match your nailpolish with the color of the leather band! I chose for this watch Loreal Eiffel for you- a perfect match! My ring is also from Michael Kors (and the bag too! You see: I love Michael Kors! )- it is a stackable ring, you can wear all 3 together or just 1. You can also turn these rings around to see the Michael Kors lettering- looks pretty cool too! This is my Guess watch paired with a Guess bracelet. I love the crystals on this watch. A Chronograph is also always looking chic and expensive. 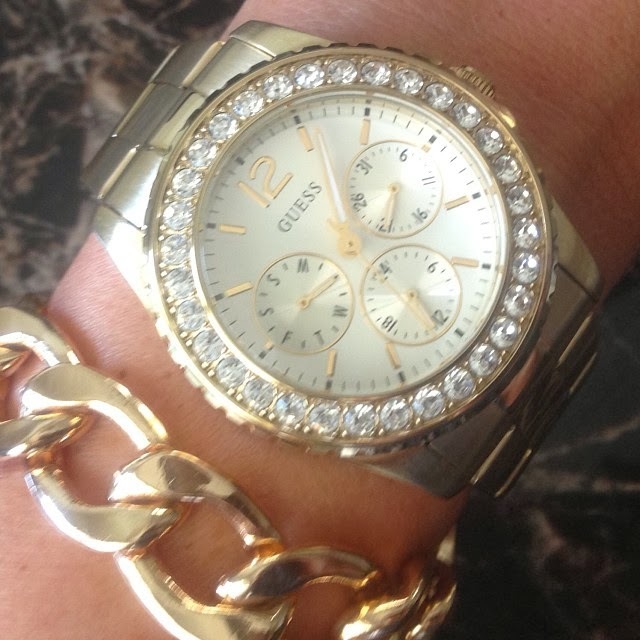 Another great choice from Guess with an overlong leather band which I paired it with a bracelet I got from TJ Maxx. And check out this beautiful Michael Kors watch. Michael Kors watches are really my favorite at the moment. They are nice and big and look like a men's watch. They are awesome statement pieces. I am pairing it here with a bracelet from bijou-brigitte. bijou-brigitte is really cool, check out if you have one in your mall. They have really cute inexpensive jewelry. The name of that store sounds french but that is only a marketing gimmick because it is actually a German store. I have been shopping in that store since I am a kid (in Germany) lol! But it is funny to see them now open up everywhere in the US! Fossil has also great choices and I like this one and wear it a lot! These bracelets I got at Burlington´s coat factory. 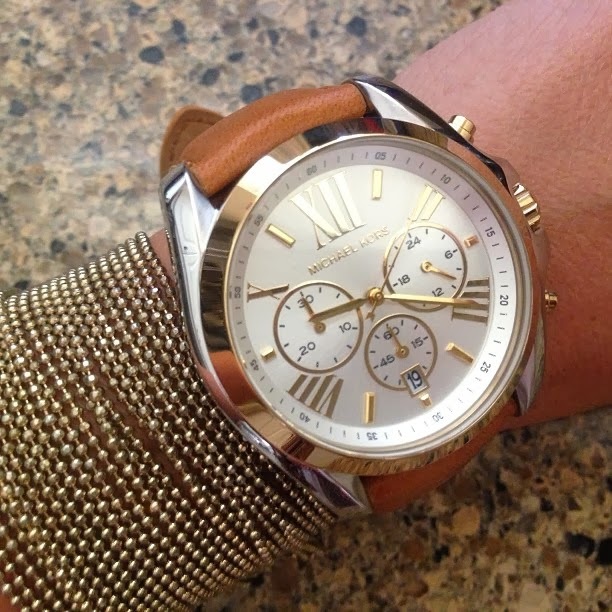 To find great deals for watches check out TJ Maxx or your Premium Outlet stores! I have been lucky there a lot! Yes, I am a Maxxinista! LOL!